Closing the laptop’s lid means that you’re through working, but for how long? Are you done for the day, or are you coming back after lunch. Windows 7 lets you control exactly what happens when you close the lid of your laptop so that you don’t have to be stuck with your laptop always going into Shut Down anymore. Choose Power Options and then select Choose What Closing the Lid Does from the left pane. 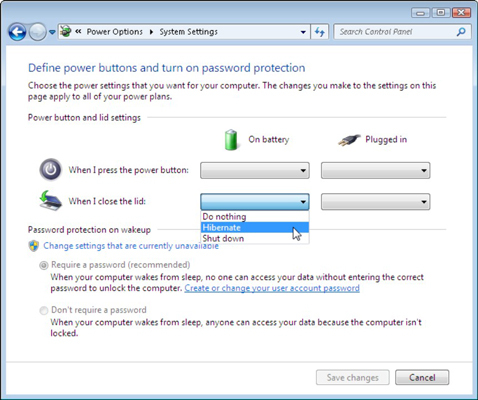 The Power Option settings allow you to change your laptop’s reaction to closing the lid. Choose the option you want from the drop-down list. The most popular choice here is Hibernate. It lets your laptop slumber in a low-power state, letting it wake up quickly so that you can begin working without delay. Click Save Changes to make your changes permanent, and close the Power Options window. If your PC is set to Hibernate when you close it, you might want to remember to do a full shut down at night. That option lets the laptop conserve its battery power and, if plugged in overnight, wake up with fully charged batteries.